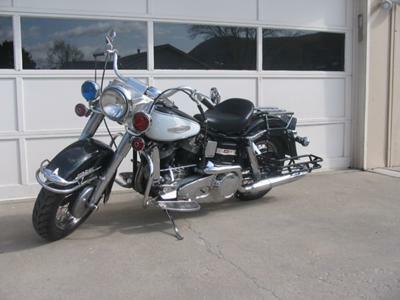 The 100% original 1966 Harley Davidson Electra Glide for sale is in "shop kept" condition. This old motorcycle runs beautifully! This was the first year model with the shovelhead engine. The vintage 1966 Harley Electraglide for sale is a rare find. You just don't find a Harley Davidson Shovelhead with all original motorcycle parts like this every day. Interested parties are welcome to contact me and when you do please tell me that you found my classified on GoGoCycles Used Harley Motorcycle Classifieds . GoGoCycles would also encourage bikers to submit a review of the 1966 Harley Davidson Electra Glide for sale to make the biker community aware of any problems that are common to this old Harley or to highlight its positive features and help potential buyers make informed decisions when purchasing vintage motorcycles like this. I'm asking just $13500 for it and that price is FIRM! Email me before this nice 66 model is gone and don't forget to mention that you found this ad on GoGoCycle's Used Motorcycles and Parts for Sale www.gogocycles.com.